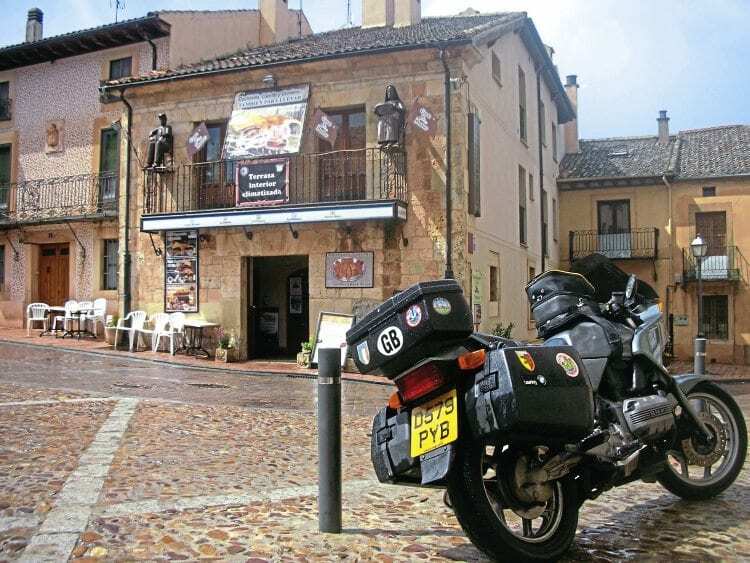 Down to central Spain on a 250,000-mile BMW. There’s no need to ride through France to get to other parts of Europe, what with direct ferries to Spain, Denmark, Holland and Germany. So why Belén and I rode off the ferry in Roscoff at Sam on a wet morning in early April is a mystery – the customs officer’s long face reflected our feelings. Still, we were heading for Spain, which is at least warmish at that time of year. France might not have been my first choice of route south, but parts of the west coast are beautiful, especially in Brittany. We avoided the motorways as best we could and many of the roads that wound their way through dense deciduous forests were spectacular. The countryside’s not so interesting from Vannes to La Rochelle, though there are long vistas towards the Atlantic, and the steep, high bridge over the Loire at Nantes is always eye-grabbing. Nantes itself is worth a stop – the old port retains all its original towers, walls and entrance channels, and there are locks to keep everything afloat when the tide goes out. The quays are lined with bars and restaurants, the people are friendly and talkative and we ate well, though expensively. 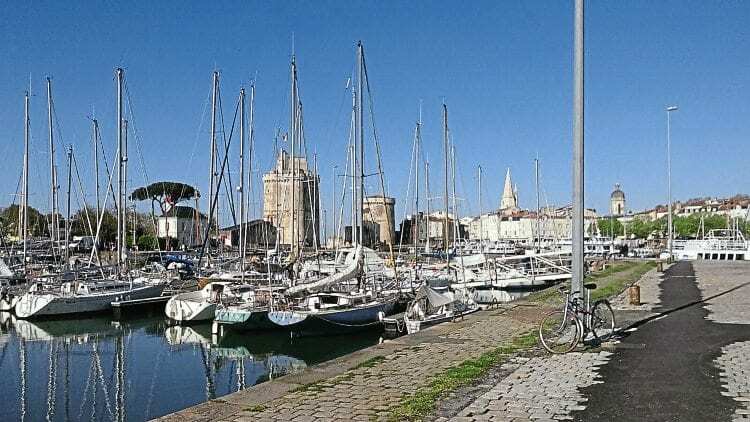 It may not be Spain, but Nantes does make for a good stop off on the way south. 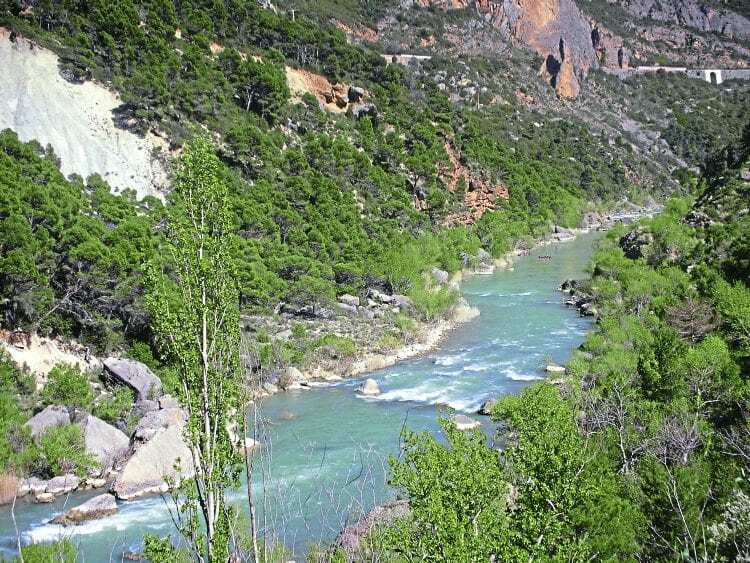 The following day we set off in the direction of Bordeaux, again dodging the motorways and taking the forest road to Irun, side-stepping when it turned into a peage halfway down. These roads were not as straight as I remembered them, and so turned out to be quite entertaining, but there were several stretches of tree-lined avenues that are typical of many French trunk routes. The traffic was much heavier than we’d expected, having read several articles about touring in France on its deserted roads. Perhaps that’s based on a comparison with UK roads. It was sunny all the way to Pau, where we stayed a couple of days. It’s a beautiful town standing high and proud above the river Gave de Pau, with some splendid and ornate bridges. It’s also deserted on Sundays and Mondays, when most of the shops are shut and the restaurants close for lunch! 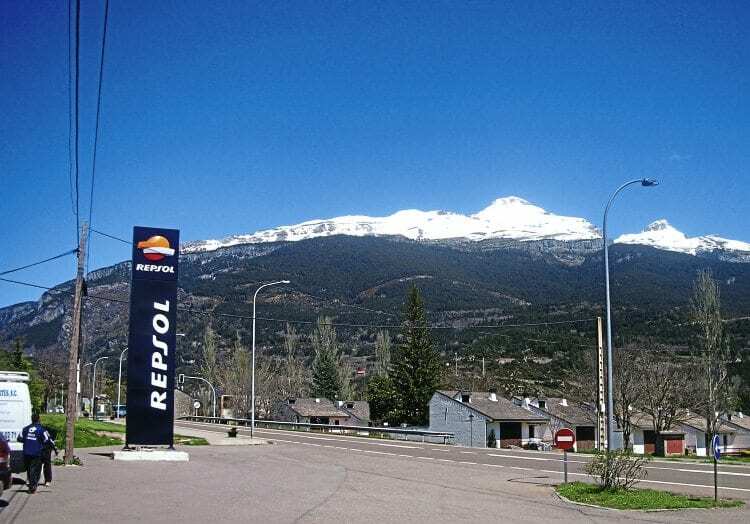 Still, it was time to head up into the Pyrenees, over the border into Spain, using the Somport crossing – one of the most spectacular mountain journeys I know, not in any way challenging but definitely beautiful. 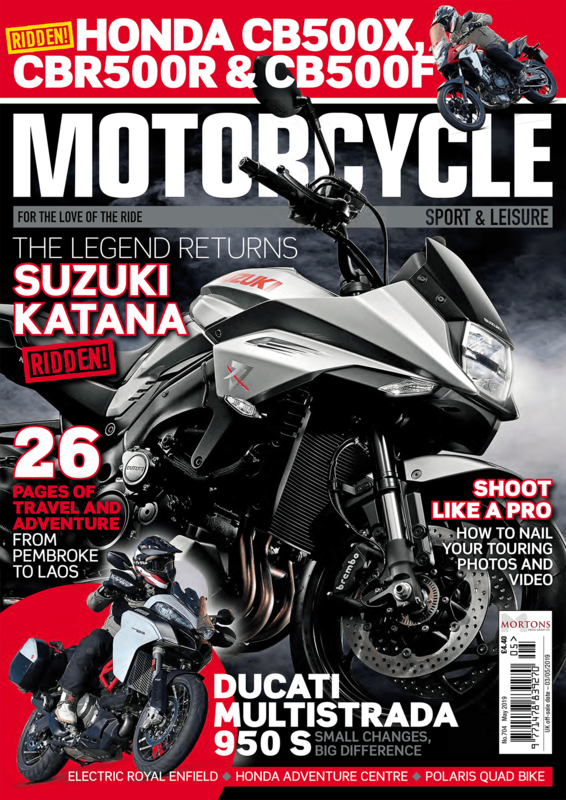 Hugh and Belen find a 29-year-old bike fine two-up over distance. Mountain waterfalls cascade down from the peaks, the narrow road twists upward and high forts cling almost desperately to the cliff edge. In the distance are the snow-clad peaks of the Pyrenees, and high-altitude flowers and shrubs give a huge spectrum of colours from spring green through purples, yellows, blues and violets. If this isn’t spectacular enough, there’s a parallel route that runs at even higher altitudes and is much narrower – lorry drivers call it the goat track. After a three-mile ride through the dark Somport tunnel we burst into the brilliant sunshine and five degrees more heat – we were in Spain, and I felt as if I was home. The French side of Somport is beautiful but the Spanish is jaw-dropping, the twisty curving pass literally carved out of the mountain rock face. We snaked our way towards Jaca, leaning in and out of the rocky sides at a good pace as lunch time was approaching fast. At Jaca, not one of the most interesting places, we headed north towards Pamplona across the plain that divides the foothills from the splendour of the peaks. It was just glorious, with long dry views and the sunshine glinting off the Tarmac. Within half an hour we came across a restaurant with off-road parking and a welcoming terrace. The menu del día was vast and just eight euros per head. Belén’s fish was whole and 2ft long and my steak overhung the plate in all directions. We ate pasta to start and fruit to finish, with coffee on the house. After lunch we sat and chatted with the owners, who said our proposed route through Ayerbe would be superb. They were right. The restaurant may not look up to much, but there’s a superb lunch on offer inside. We followed the highway for about three miles then rode into the Puente de Pirineos, which is a fantastic geological fault line with rock formations straight out of an old Western. The entrance is over an old iron bridge that crosses azure blue salt lakes, and leads through an ancient rock tunnel to a little winding lane that twists its way down the mountain face to a gorge with a rushing river and rapids. At Ayerbe we took another lane, but this one was interminable, climbing up and down a boulder-strewn landscape on a surface better suited to trail bikes than our K75. Finally we emerged onto a stretch of good road that took us to Tudela for the last day of the spring vegetable fiesta. This is to celebrate the pickling of the previous autumn crop and the first cut of the new crop – there are hundreds of varieties, including some that don’t exist anywhere else. Simply bewildering, and you can sample them all as tapas… given time. 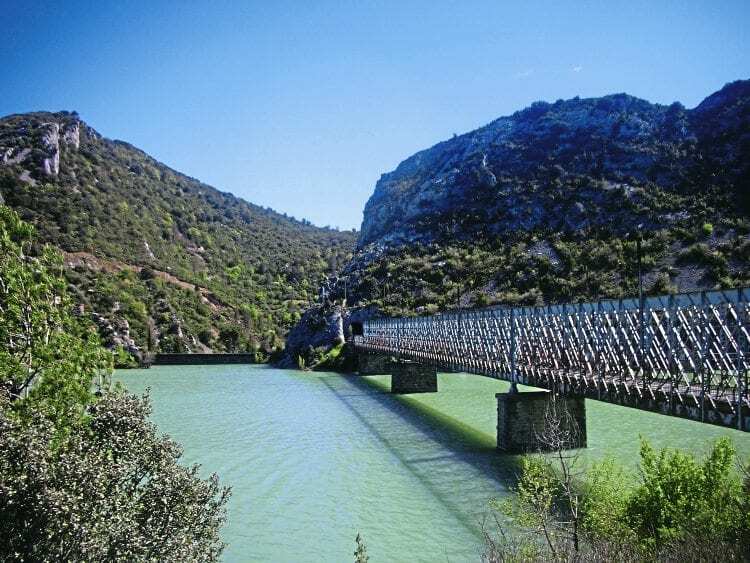 Old iron bridge leading into a tunnel is the gateway to Puenta de Pirineos. Wednesday was a bit cloudy and the very accurate weather channel forecast rain before we reached Segovia. Yep, it even rains in Spain. We climbed out of the town on to the high plains and past Cascante, where I used to buy olive oil to sell in England. It had such a smooth, sweet taste you could drink it neat and live forever. The road was good and fast without much traffic and soon we were munching breakfast in a small roadside bar. Then on to the foothills of the Sierra de Guadarrama, the high mountain range that protects Madrid from the northern winds, and where we saw several black vultures and a pair of golden eagles swooping over a lake just 100 yards from the road. Fascinating rock formations at Puente de Pirineos. Meanwhile, the clouds were lower and blacker than I’d seen for a long time, and soon the deluge started, with lightning clearly visible over the hills. Fortunately, we were just rolling into a town for lunch, so parked under the church tower, told the bike to pray for a change of wind direction and dashed into the nearest dining room. The food wasn’t all that good but a mimicking parrot kept us company, which took the edge off it. It was still raining cats and dogs as we finished, but then suddenly it was all over! 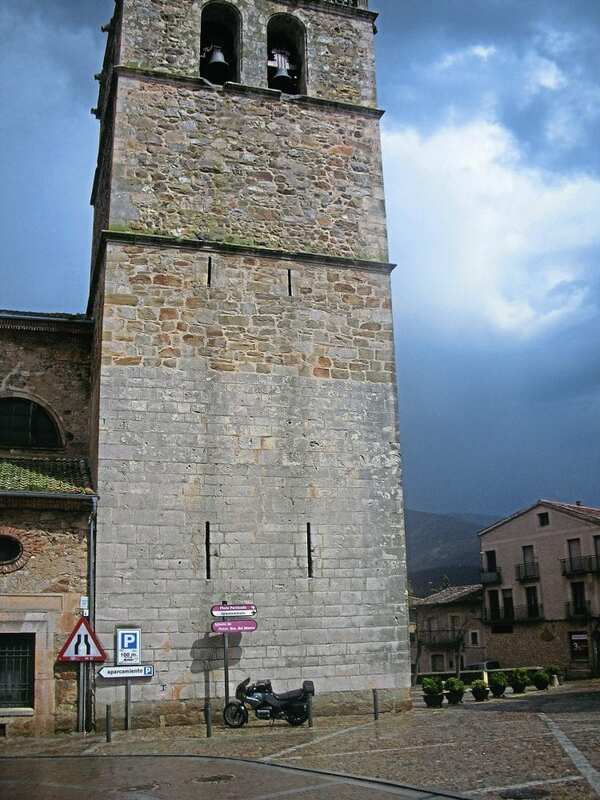 It really does rain in Spain – timely stop for lunch during a thunderstorm. After a slippery mount up we were away again, pounding our way south west along the gently curving trunk road, but just before descending into Segovia the winds got up in a rush. They thrashed us around quite a bit and we stopped to let it blow over, which it did within half a café con leche. Having found the right road to run parallel to the peaje (Spanish peage) we sneaked along the lower end of Guadarrama and into Espinar to meet up with friends. 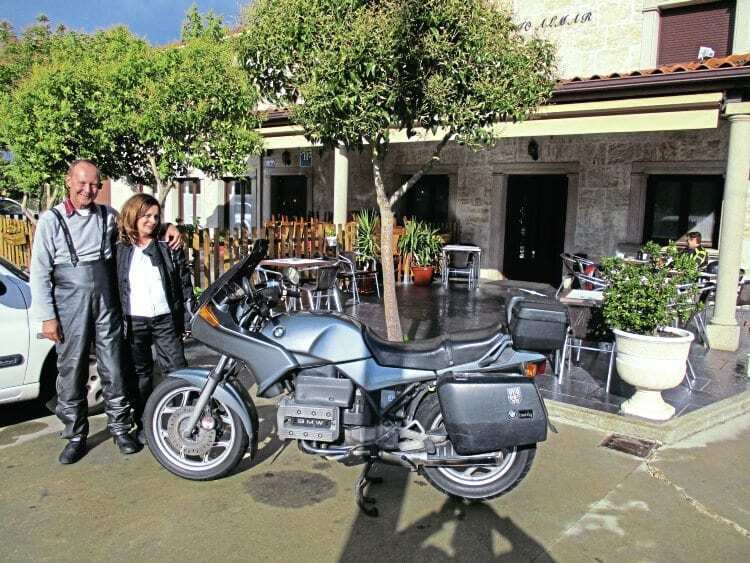 This man lives in Spain, leads motorcycle tours there and clearly loves the place. In the morning we were only an hour and a half from home, the sun was out again and we flew the last few miles via the ancient and well-known walled city of Avila. There are many ways to get to Salamanca overland, or the easiest, quickest, cheapest and most comfortable way is by ferry to Santander. But riding from France, crossing the mountains via Somport, then turning south along the N121 to Pamplona… well, these are not biking roads to be missed. The BMW was bought new from Vincent and Jerrom in Taunton in May 1987. With all the luggage and new riding kit it came to just under £5000 on the road. 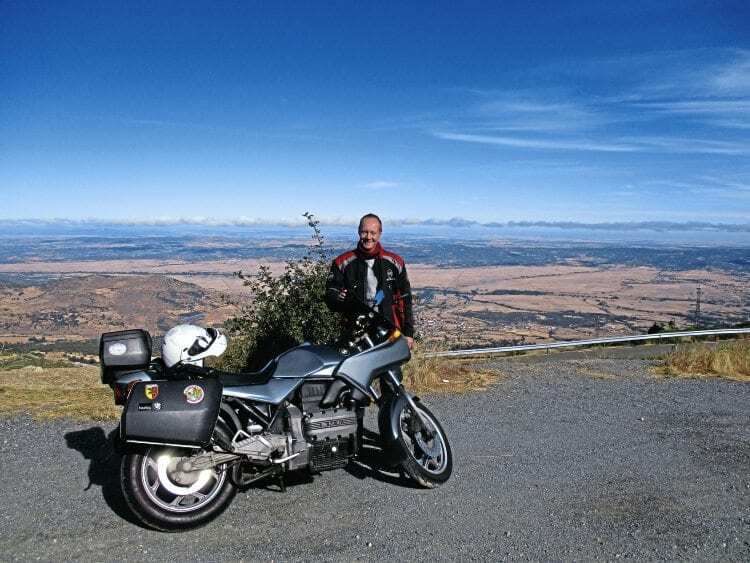 Since then, Hugh reckons it’s covered about 250,000 miles, having been to Rome and back five times, to France, Germany, Austria, Portugal and seen most of Spain. He still uses it every day for work, and in the summer covers about 4000 miles a month, leading bike tours from Salamanca. It hasn’t been perfect. K75s had a recurring problem with the speedometer head, and this one had six new heads fitted in its first seven years. None of them worked, BMW never go to the bottom of it, and I don’t think anyone else has either. Hugh Anderson now runs Sierra Almer Tours from Salamanca. 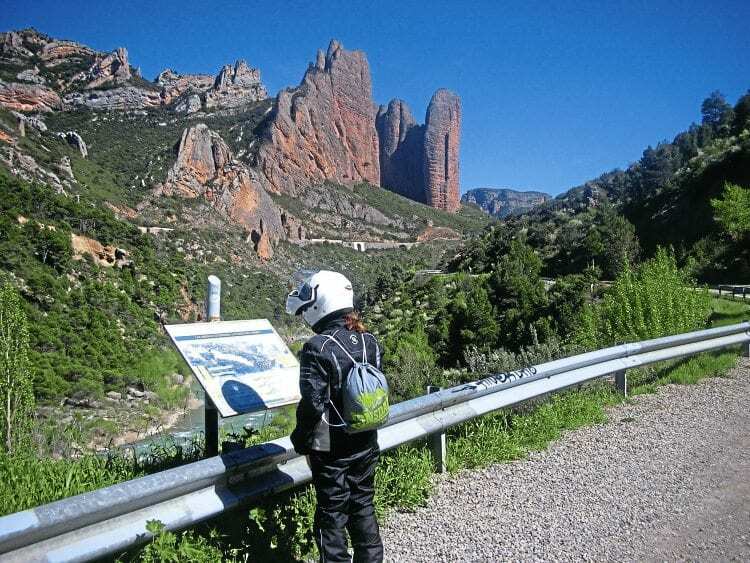 Many more bikers are enjoying the relatively unknown parts of central Spain – a superb motorcycling territory – and Hugh’s company offers the opportunity to enjoy the local culture with the help of the Spanish-speaking guides. Visit www.sierraalma.com for more details of the mountain passes, valley highways, country lanes and the long vistas of the open plains. And of course, great weather.